Full colour map of Scotland at 8.7 miles to 1 inch (1:550,000) with clear,detailed road network and administrative areas shown in colour. 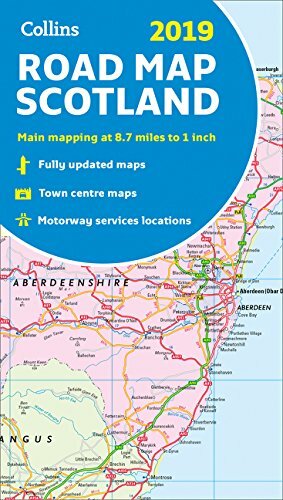 The mapcovers the whole of Scotland and part of Northern England conveniently onone side, and is ideal for reference or route planning.The map shows the road network in detail for easy route planning. It is ideal for businessusers also, with its political colouring of local council areas.